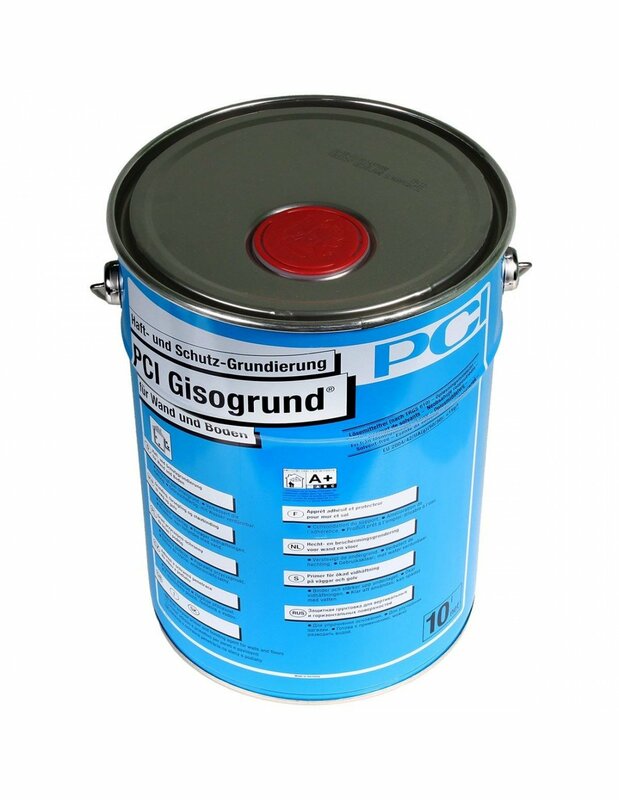 PCI Gisogrund is a single component, solvent free, fastdrying primer. With PCI Lastogum makes perfect combination to make your shower area waterproof. 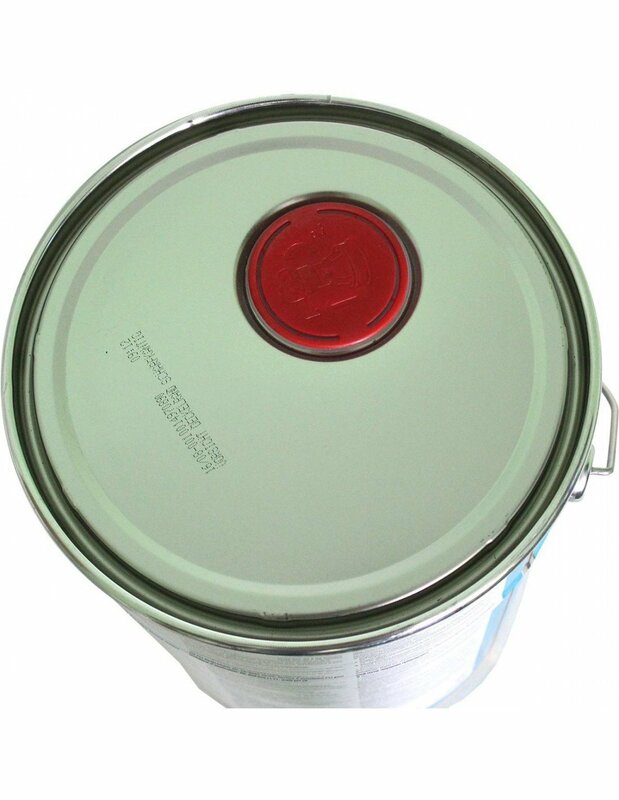 The primer is recommended for mortar mineral floor leveler, plasters, paint and wallpapers. It is also useful for primer deep penetration to increase strength of ground with insufficient toughness. PCI Gisogrund characterized with reliable adhesion with tile adhesives. Also, product cures extremely fast - after application, it is walkable after approx. 30-60 minutes. 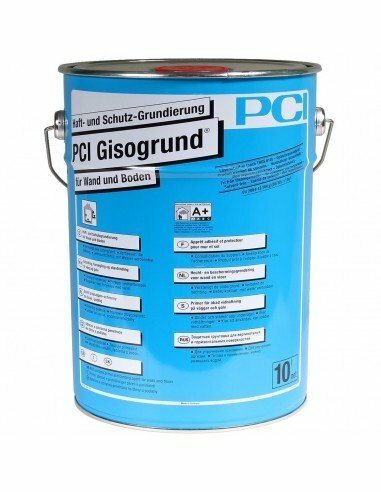 PCI Gisogrund 10L pail will cover: gypsum based substrates: approx. 65 to 125m², abosrbent mineral substrates: 37-65m² for two coats. Primer for absorbent substrates to protect subsequent material from too rapid dehydration. Primer prior to the application of flowable and non-sag floor levelling compounds, e. g. PCI Periplan, PCI Periplan fein or PCI Periplan Tixo and other mortars and anhydrite screeds which set through hydration. 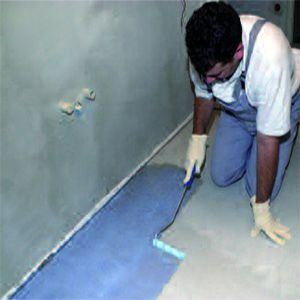 Primer for anhydrite screeds and building boards. Primer for mastic asphalt screeds prior to the application of PCI tile adhesives. Primer to strengthen mealy, absorbent screed surfaces and plasters indoors prior to the laying of tiles and mosaic. Acting as a moisture barrier and primer for plaster, plaster slabs, gypsum fibre boards, plaster boards, aerated concrete, concrete, asphalt, render and brickwork before tiling and wallpapering. Primer for aerated concrete and brickwork on walls prior to the application of plaster and gypsum lime plaster. 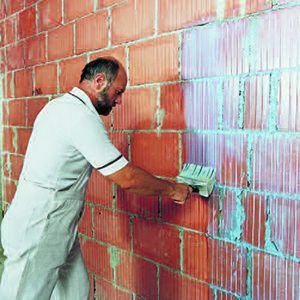 PCI Gisogrund improves the adhesion of plaster and lime gypsum plaster to brickwork. 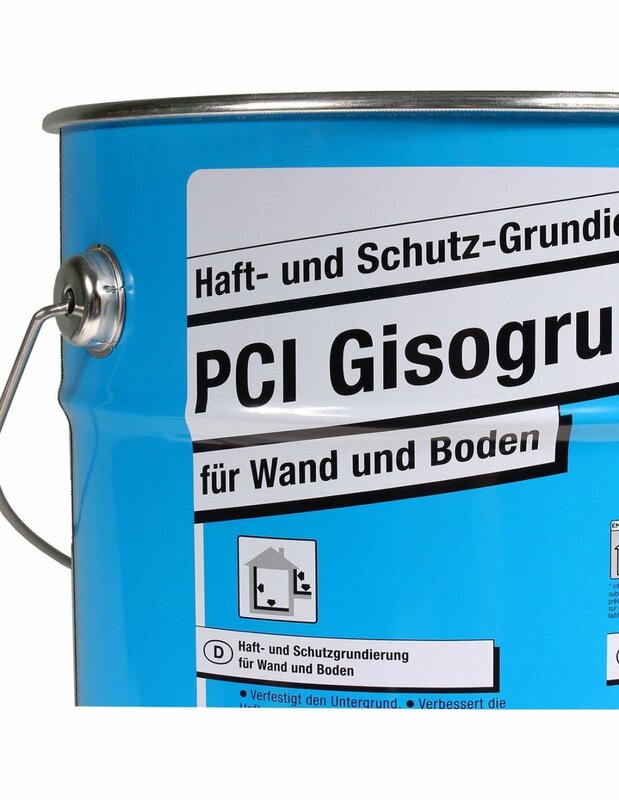 PCI Gisogrund protects levelling compound and thin-bed mortar from too rapid dehydration, extends the open time, helps improve adhesion and prevents the formation of cracks caused by shrinkage. PCI Gisogrund helps improve the strength and solidity of old, mealy plaster and increases adhesion to tiles, plaster and wallpaper. The substrate must be structurally sound, clean and able to bear weight. Remove oil stains, residues which could impair adhesion such as waterproof adhesive residues, cement paste and dirt very thoroughly. Newly applied cement screeds must have a moisture content level not exceeding 4%, rough-ground anhydrite and/or gypsum based screeds not more than 0.5% (measured with CM meter). Stir PCI Gisogrund well prior to the application (and/or shake 1 litre bag well). Apply a sufficient quantity of undiluted PCI Gisogrund by brush or float to achieve a uniform coat. Avoid puddles forming! Check strengthening and curing by scratching the surface. Do not apply tile adhesive, wallpaper, paint, plaster or PCI Periplan, PCI Periplan fein or PCI Periplan Tixo before PCI Gisogrund is dry. Priming and strengthening of absorbent mineral substrates, e.g. concrete, cement screeds, gauged renders, aerated concrete, limestone or similar. Stir PCI Gisogrund well (and/or shake 1 litre bag well), dilute 1 : 1 with water and mix thoroughly. Apply a sufficient quantity of diluted PCI Gisogrund by brush or float to achieve a uniform coat. In case of very absorbent substrates it is recommended to apply a second coat of PCI Gisogrund, diluted 1 : 1 with water, to achieve a more intensive strength and to avoid blow holes forming. Do not apply the second coat until the first one has completely cured. Do not apply tile adhesive, wallpaper, paint, plaster or PCI Periplan, PCI Periplan fein or PCI Periplan Tixo as floor leveller before the primer is dry (scratch proof). Do not apply at temperatures below +5 °C and above +30°C. Clean tools with water immediately after use. Once cured material can only be removed by mechanical scraping. In case of partial tiling the entire wall area should be primed (e.g. behind the bathtub or above the tile covering). Apply only one coat of PCI Gisogrund, diluted 1 : 1 with water (consumption: approx. 100 to 140 ml of diluted mix per m²) before wallpapering on plaster/render, gypsum plasterboards etc. 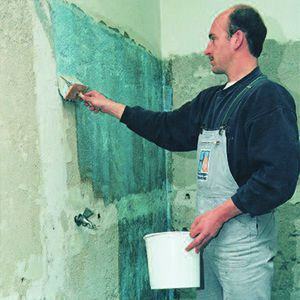 The curing time of the wallpaper paste slows down when wallpapering on substrates primed with PCI Gisogrund. Do not paint over woodchip wallpaper etc. before the paste has completely cured. The first coat of PCI Gisogrund can be diluted 1 : 2 with water in case of very absorbent substrates, e.g. aerated concrete. Follow the recommendations issued by the gypsum industry regarding the maximum permissible moisture content, layer thickness of gypsumbased substrates and their surfaces. Avoid puddles forming when applying PCI Gisogrund to floor areas. Use particle filter mask P2 for spray application. PCI Gisogrund is not suitable to prime water-soluble adhesive residues (e.g. 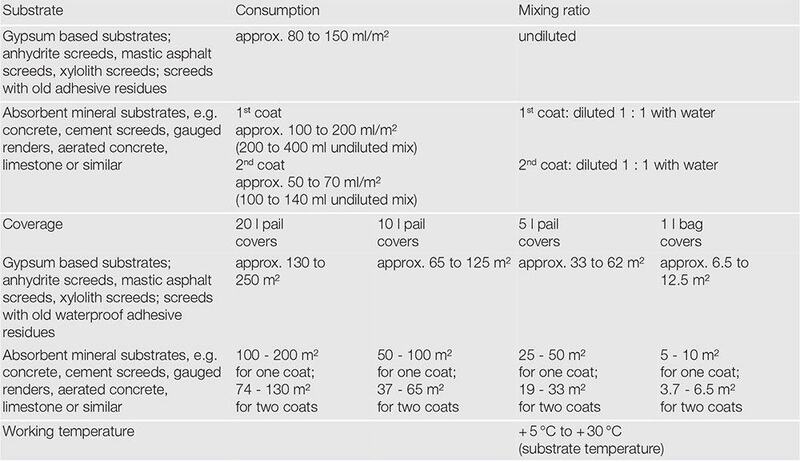 sulphite liquor adhesives). They must either be completely removed or primed with PCI Epoxigrund 390 (sprinkle with silica sand while still wet). Old adhesive residues must be completely removed before laying natural stones. Do not apply PCI Gisogrund in underwater situations. 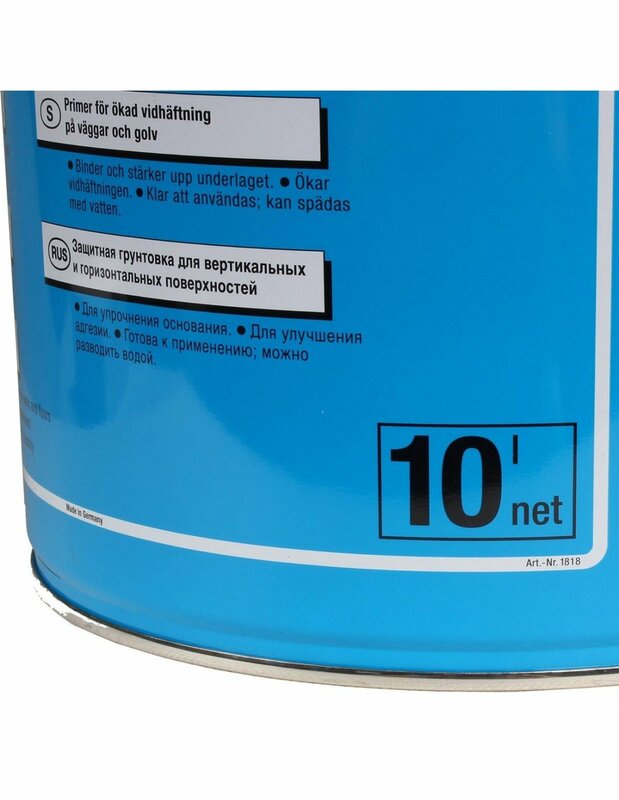 Use PCI Gisopakt bonding agent to prime concrete and limestone before applying plaster and gypsum lime plaster. Chat started. Session ID: 1556194574. You are now connected to: David M.